NEW ORLEANS – The first countable day for at-large consideration for the 2017 NCAA Division I Cross Country Championships just passed (September 8) and that means we’re about to get into the meat of the season. 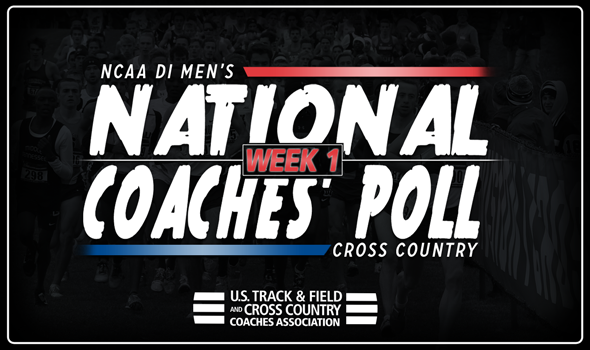 You should begin to see the NCAA Division I Men’s Cross Country National Coaches’ Poll start to shift as well – even more than it did between the preseason and Week 1. In the most recent poll that was released Tuesday by the U.S. Track & Field and Cross Country Coaches Association (USTFCCCA), 18 of the 30 teams moved spots. There weren’t any changes atop the poll, which is where Northern Arizona, Stanford and Syracuse sit in order. The Lumberjacks remain No. 1 and own seven first-place votes, while the Cardinal hauled in three first-place votes of their own. The Orange is a distant third. Colorado took Syracuse’s first-place vote from the preseason and is up to a pair now, which moved Mark Wetmore’s team from No. 5 to No. 4. The Buffs opened the season two weeks ago at the Colorado State Invitational and cruised to the team title and got an individual win from Ethan Gonzales and strong efforts from Eduardo Hererra and Joe Klecker. Arkansas dropped one spot to No. 5, while BYU and Wisconsin hold down No. 6 and No. 7, respectively. Oregon went from No. 9 to No. 8 (Iona dropped from No. 8 to No. 9) and Oklahoma State rounds out the top-10. Furman jumped three spots from No. 17 to No. 14 and owns its best ranking since 2015 when it was 10th in Week 5. The Paladins won both the Eye Opener Invitational two weeks ago and their own Furman Invitational this past weekend. Middle Tennessee State went from No. 21 to No. 19 – its best ranking in program history. The Blue Raiders have only been ranked six times in the National Coaches’ Poll, but following their win at the Brooks Twilight Classic, voting coaches saw them on the rise. UCLA is No. 22 after a three-spot jump from the preseason. Indiana found itself back in the top-30 for the first time since Week 6 of last year. The Hoosiers are ranked No. 27 and cruised to a victory at their invitational this past weekend over the likes of Minnesota and Ohio State. Wisconsin competed but ran an abbreviated team. The 2017 NCAA Division I Cross Country Championships will be held Saturday, November 18 at E.P. “Tom” Sawyer Park in Louisville, Kentucky.